The first step in defeating canine obesity is figuring out whether your dog is actually overweight or not. Sounds simple, but in our experience most folks don’t even get to this first step because they refuse to even consider the idea that their dogs might be overweight. Instead, they just reject the possibility out-of-hand. Which is easy to do because determining whether any specific dog is overweight is not always such an obvious thing. Unlike human obesity, which we can all spot pretty intuitively, identifying a case of canine obesity is not always a matter of pure common sense. Case-in-point: according to the Association for Pet Obesity Prevention, of the more than 41 million overweight dogs in the United States, more than 40 percent of them belong to owners who mistakenly believe that their dogs are an appropriate body condition. Think about that for a moment. That’s 17 million dogs whose lives are at risk of being cut short by obesity because their owners don’t properly understand what canine obesity really looks like. Pretty scary. Now, if you are brave enough to be honest with yourself about the possibility that your dog is overweight, then we recommend that you employ a body condition scoring chart like the one below (downloadable here if you have trouble reading the small type in the image below) in order to find out for sure one way or the other. Charts like this one are the most common tools that veterinarians use to analyze dogs for obesity. They’re remarkably simple to use. You just use the verbal descriptions and silhouette images on the chart to match your dog with the appropriate BCS category. Then you see what the implications of that category are for your dog’s overall body condition. That’s it. The whole process takes just a couple of minutes and requires exactly zero special training or advanced tools. 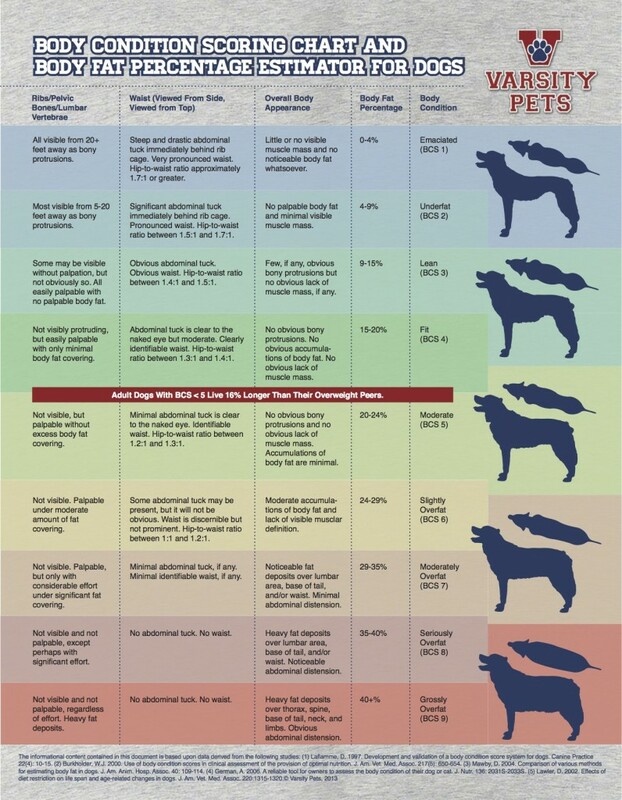 We’re particularly fond of our BCS chart because it gives you an idea of your dog’s overall body fat percentage and because it incorporates the results of several different published studies (cited on the chart itself). So, if you’re up to it, we encourage you to give it a shot with your dog today.